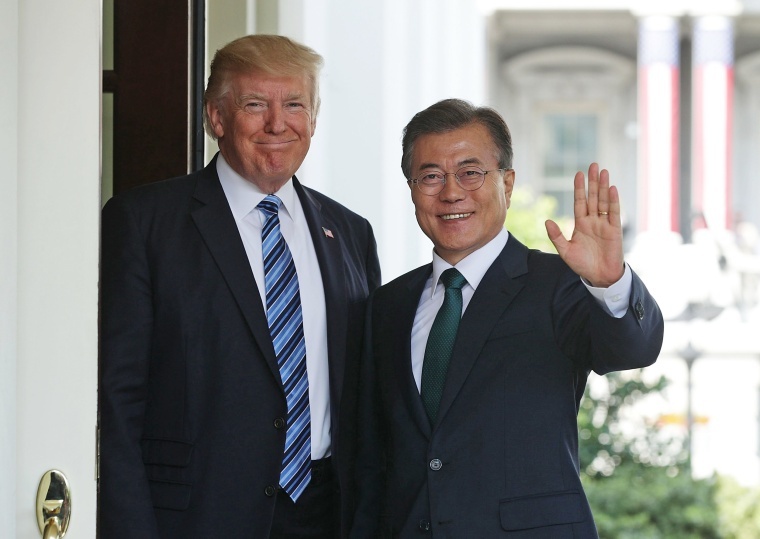 SEOUL — U.S. President Donald Trump agreed with South Korean President Moon Jae-in to revise a joint treaty capping the development of the South's ballistic missiles, Moon's office said on Saturday, amid a standoff over North Korea's missile and nuclear tests. Trump also gave "conceptual" approval to the purchase by the South of billions of dollars of U.S. military hardware, the White House said. The South wants to raise the missile cap to boost its defenses against the reclusive North, which is pursuing missile and nuclear weapons programs in defiance of international warnings and UN sanctions. "The two leaders agreed to the principle of revising the missile guideline to a level desired by South Korea, sharing the view that it was necessary to strengthen South Korea's defense capabilities in response to North Korea's provocations and threats," South Korea's presidential Blue House said. North Korea sharply raised regional tension this week with the launch of its Hwasong-12 intermediate-range ballistic missile that flew over Japan and landed in the Pacific. That followed the test launch of two long-range ballistic missiles in July in a sharply lofted trajectory that demonstrated a potential range of 6,000 miles or more that would put many parts of the U.S. mainland within striking distance. South Korea's development of its ballistic missiles is limited to range of 500 miles and payload weight of 1,100 pounds under a bilateral treaty revised in 2012. South Korea has said it wants to revise the agreement to increase the cap on the payload. The two countries agreed to the cap as part of a commitment to a voluntary international arms-control pact known as the Missile Technology Control Regime, aimed at limiting the proliferation missiles and nuclear weapons. The two leaders pledged to continue to apply strong diplomatic and economic pressure on North Korea and to make all necessary preparations to defend against the growing threat by the North, the White House said. The White House did not mention the voluntary bilateral agreement but said the two leaders agreed to strengthen their defense cooperation and South Korea's defense capabilities. Trump "provided his conceptual approval of planned purchases by South Korea of billions of dollars in American military equipment", the White House said. Trump, who has warned that the U.S. military is "locked and loaded" in case of further North Korean provocation, reacted angrily to the latest missile test, declaring on Twitter that "talking is not the answer" to resolving the crisis. North Korea defends its weapons programs as necessary to counter perceived U.S. aggression, such as recent air maneuvers with South Korean and Japanese jets.